India is home to an incredibly beautiful diversity of food, colour, smells, sights and architecture while for many, it is also a symbol of religious significance and history. The country boasts a vibrant culture, steeped in tradition and there are few better places to really get a feel of this than at the iconic ancient temples scattered around India. Some Hindu temples in India date back thousands of years, and have come a long way from simple rock-cut caves. 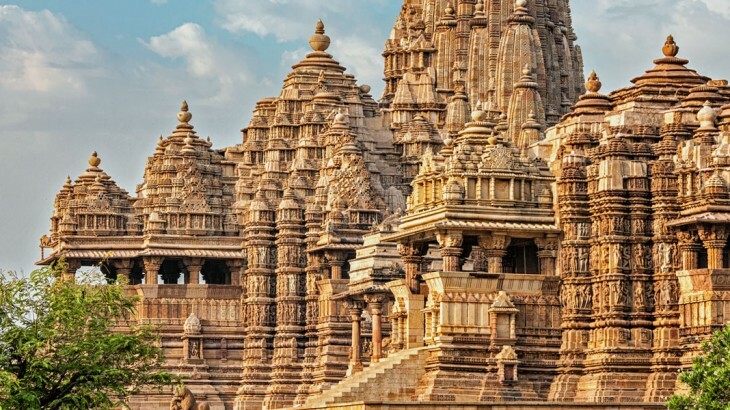 As a country, India is home to any number of incredible sights, but for anyone heading off on a tour to India then these are the temples to look out for. The Archaeological Survey of India (ASI) dates the Mundeshwari Devi Temple back to 108 AD, and it is believed to have been built during the Saka era. Twin brother of God Vishnu, Narayana, was the presiding deity of the temple. A statue of Narayana eroded away over time, and in 348 AD Viniteswara was established as the minor deity for the temple, remaining behind Narayana as the main god. You can find the temple, which is one of the earliest examples of Nagara temple architecture in Bihar, just 10 kilometres from the small town of Bhabhua on top of the Kaimur Hill. 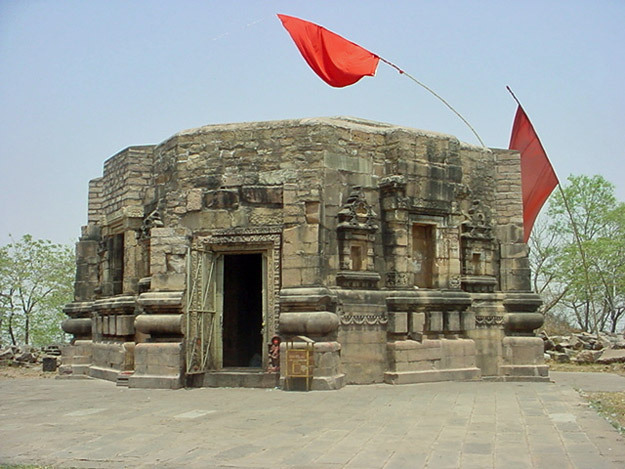 The octagonal temple is one of the oldest still functioning in the world. If you wish to visit the temple, we would highly recommend going during the Ramnavami and Shivrati festivals, when it is awash with colour and flooded with devotees. During Navrata, thousands of locals from Rohtas, Gaya, Aurangabad, Bhojpur, Varanasi and other districts in Bihar descend upon the temple. 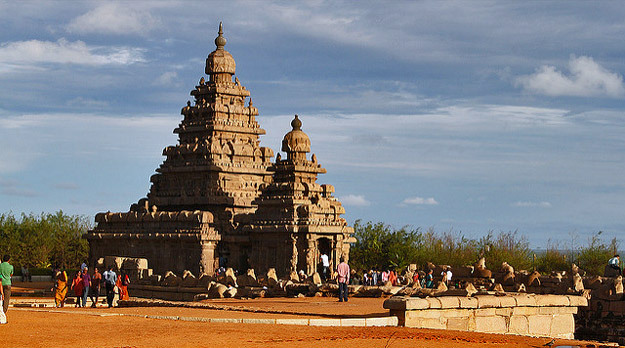 The Shore Temple at Mahabalipuram can be found close to Chennai on the shores of the Bay of Bengal. Believed to have been constructed in the 7th century during the reign of King Narsimha-Varman II Rajasimha, the Shore Temple consists of a carving of Anantashayana Vishnu, a large open air rock relief of the God Vishnu. The incredibly impressive temples were built from huge boulders, having been cut down into intricate shapes and detail. The temple is dedicated to Lord Shiva, and has been classified as a UNESCO World Heritage Site. These towering temples are a spectacle in their own right, but when they are coupled with the beautiful coastline that the Bay of Bengal offers, they become one of the most awe-inspiring sights in India. Starting on the 25th December, the annual Mahabalipuram Dance Festival, which is organised by the Department of Tourism and the Tamil Nadu Government, is famous the world around. Running until the first week of February, the festival is shown every Saturday and on each government holiday. Another temple dedicated to Lord Shiva, the Brihadeshwara Temple, is also known as Peruvudaiya Kovil and can be found at Thanjavur in the state of Tamil Nadu and is one of the oldest ancient temples in the city. This temple is a significant example of Indian architecture and is considered one of the finest. It signifies the power of Raja Raja Chola I, a king who ruled the Chola kingdom of southern Indian between 985 and 1014 CE. Built by Raja Raja Chola I in 1010AD, the ‘Big Temple’ celebrated its 1,000th birthday back in 2010. Such is its significance, it is a part of the ‘Great Living Chola Temples’, which became a UNESCO World Heritage Site. 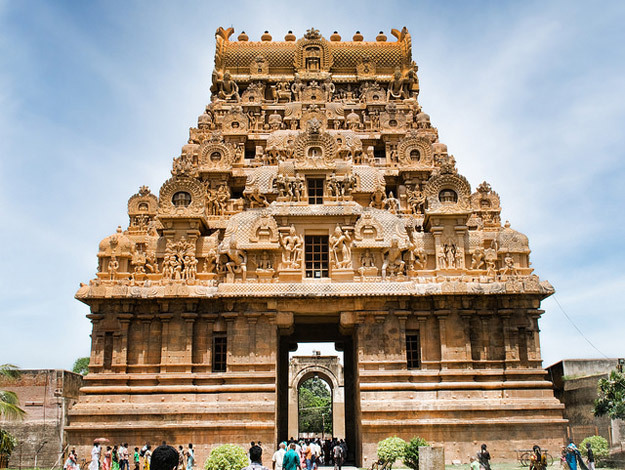 Standing at over 66 metres, it is surrounded by imposing walls which were added around the sixteenth century and is made up of one temple tower called Vimana. A statue of a sacred bull, or Nandi, which measures thirteen feet in height, stands proudly at the entrance of the temple. An interesting fact about the temple is that its shadow disappears at noon every day. Despite being one of the tallest temples of its kind in the world, the design of the tower means that it doesn’t cast a shadow at noon at any point during the year. 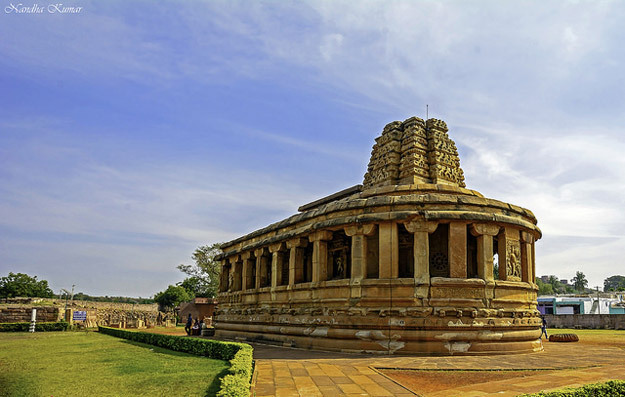 Considered one of the earliest temples in India, the ‘Lad Khan Temple’ in Aihole was built around 450 AD, before being converted by a Muslim prince called Lad Khan into his private residence many years later. However, there are many myths and legends about the name and its origin. The temple was made by the kings of the Chalukya dynasty, with its style coming from that of Panchayatana, boasting 12 pillars and an open central area with a shrine for Lord Shiva and including a Nandi, although it was originally supposed to be dedicated to the Hindu god Vishnu. As a whole, the temple has a number of unusual features, including a porch fronting a square mandapa, where a Nandi faces a small interior shrine. Aihole, which is in the state of Karnataka, was once the capital city of the Chalukya Dynasty, with a powerful history of wealth and prosperity. There are believed to be around 125 temples in and around Aihole, signifying its cultural and architectural significance during this time. Possibly one of the largest temples in India, this site features 49 separate shrines, all of which are dedicated to Vishnu. For worshippers to reach the inner shrines, you must pass through the seven gopurams, the first of which was added in 1987 and stands at 73m high as one of Asia’s tallest temple towers. This temple is unlike any you will have been too – expect to navigate yourself past cars, shops, and motorbikes to make it to the fourth gopuram and the temple proper. Widely considered to be the most important of all the 108 main Vishnu temples, the entire complex of the temple measures 156 acres, or 631,310 sqm, and includes 21 separate and equally magnificent towers. It is one of the most popular temples in India for its visitor numbers and also one of the wealthiest, which is shown by the golden dome in the middle of its imposing layers. Also known as the Thiruvaranga Tirupati, Bhoologa Vaikundam, Periyakoil and Bhogamandabam, the seventh enclosure is currently unfinished, with the gopuras potentially reaching 50 metres high. 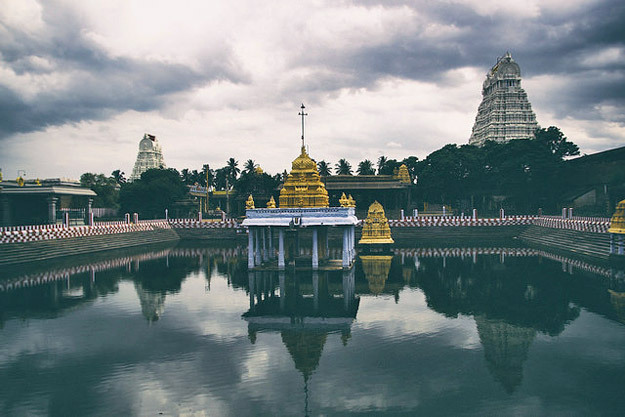 Unsurprisingly, it is extremely popular with pilgrims, situated above Tirupati in the south of Andhra Pradesh on the banks of the river Cauvery. You can walk the 4,000 steps up the hill towards the temple, but this can take up to four hours. Easiest options to reach the temple are by the regular buses, but you can get there through traditional Indian modes of transport or by walking. The Chidambram temple is a Hindu temple for Lord Shiva and can be found at the beating heart of Chidambaram, Tamil, an ancient temple town. The temple itself is 78km south of Pondicherry, and 235km from Chennai. Spread over 50 acres slap back in the middle of the city, the temple’s area is wholly dedicated to Lord Shiva Nataraja and Lord Govindaraja Perumal, which means that it is one of just a few temples where the Shaivite and Vaishnavite deities are enshrined in one place. Chidambaram is derived from chit, meaning ‘consciousness’ and ambaram, which means ‘sky’ from aakasam. It refers to Chidaakasam, which is the sky of consciousness that all Vedas and scriptures believe is the ultimate aim for anyone to achieve. It is home to one of just a few examples of Shiva being represented by an anthropomorphic murthi, with the bejewelled image of Nataraja. 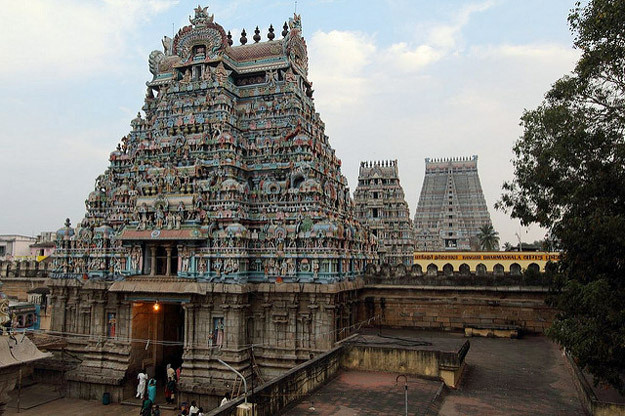 Made up of five courts, Aragalur Udaya Iraratevan Ponparappinan rebuilt the Siva temple at Chidambaram around 1213 AD and has been administered by an endogamous group of shiavite brahmins called Dikshitar. 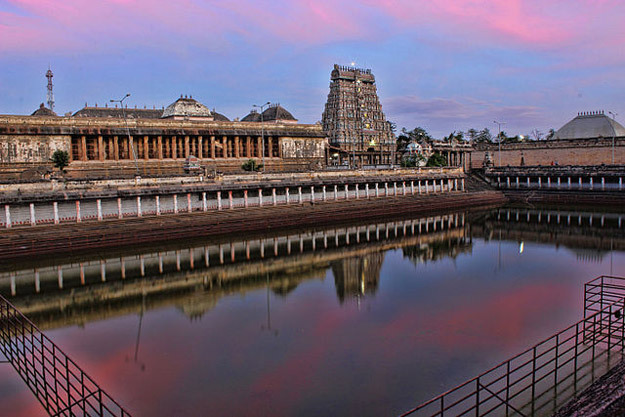 A legend surrounding the temple dates back to when Lord Shiva rolled into Thilai Vanam (a forest of mangrove trees) where a group of saint, or ‘rishis’ were residing. These rishis believed that God can be controlled by magic and magical words. Shiva strolled into the forest but in the form of a simple mendicant, along with Lord Vishnu and Mohini. The rishis’ wives were enchanted by their brilliance and beauty, which angered the rishis’ into releasing scores of serpents, but the Lord simply lifted the serpents and wore them as ornaments. Angered further, they then release a tiger, which Shiva skins and wears as a shawl, before they use all of their spiritual strength to summon a demon, Muyalakan. Lord Shiva simply steps on the demon’s back to immobilise it before performing the dance of eternal bliss, the Ananda Thanndava, and discloses his true form. 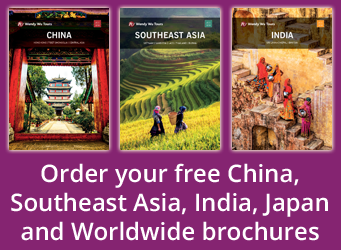 Book an India tour where you can explore all of its ancient temples and wonderful sights with the UK’s leading Asia Experts, Wendy Wu Tours. Our fully inclusive, escorted tours of India visit all the major sights for an unforgettable holiday. India culture, history, tourism. permalink.